There was trouble on the Island of Sodor this morning as I cleared the breakfast mess. “Can’t Sir Topham Hatt get Percy to share?” I asked. “He won’t listen,” Boots said, shaking his head sadly. Within minutes, though, the skies were sunny again. 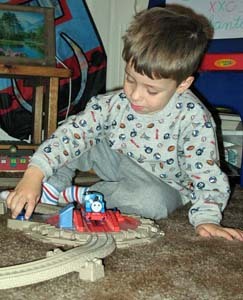 “The trains went to the carnival for Thomas’s birthday. They’re taking turns riding the Ferris wheel. Wheeeeeeeeeee! Oh, Percy is going to jump off! That’s fun!” Boots said. And that’s when it hit me. Yesterday, Big Guy was jumping off the back-yard swing, but Boots couldn’t quit work up the nerve to try. Percy is Big Guy – green is his favorite color. Thomas is Boots – blue is his favorite color, plus if you can’t have a starring role in your own fantasy, when will you ever get one. Who knows how long Boots has been telling me exactly what’s going on in his little mind by letting Thomas and friends do the talking. I’ve been too stupid to listen until now. It makes sense that he would start using Thomas. The engines taught him to count, and he could sort of say most of the trains’ names before he was 2. Still, I’d looked for him to start communicating through El, his much-worn elephant lovey. Up until a few months ago, Big Guy had always worked it out with Bear. As much as Boots loves El, though – and the fact that he’s far more worn out than Bear even though Bear is 2 years older proves the adoration – Thomas has been virtually a life-long obsession. Now that I’ve cracked the code, I’ll know what to look for. There’s only one problem. James is red. My favorite color is red. This morning, James took Thomas and Percy down a track that was covered with oil and they all derailed. Either Boots is remembering when he and Big Guy busted their butts after I mopped the kitchen the other day or he’s questioning my leadership. definitely – it’s the mopping…not the leadership. On a good day, I’m only going to get a split decision on that one, Leslie!